When my daughter was young she had a swing set, sand box and playhouse on the left side of my garden. She loved playing there, and we chose this area of the garden so that I could see her playing from my kitchen window. 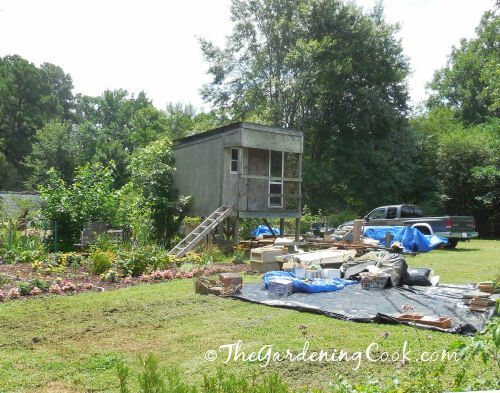 All that is left of the set up is the playhouse, which has turned into a horrible eyesore next to my perennial and vegetable combination garden. It has become a place to store things and (alas) a place to dump stuff. We knew that we wanted the playhouse in the back part of the garden but moving it became quite a challenge. 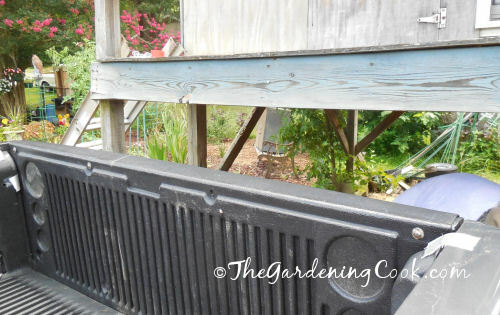 A neighbor originally brought it into our garden on the back of a truck bed, and we have a truck, so we thought it would be as easy as the original move had been, but this was not to be, as you will soon see. The first step was to clear out under the play house and to remove all of the items that had been “stored” in it for the last 15 years. I say stored because much of it was just destined for the trash. 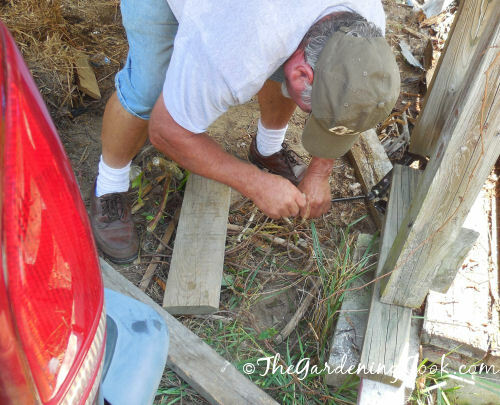 The legs of the playhouse were sitting on cement blocks, so raising it involved jacking the whole thing up. 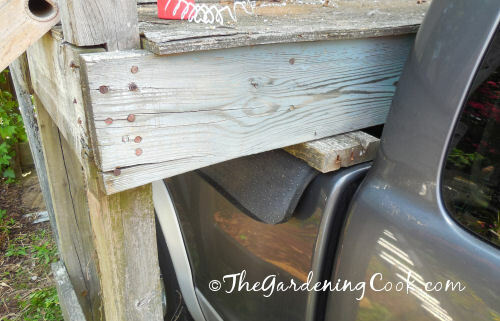 We use a Honda Civic car jack at first but switched to a hydraulic jack later in the project because it took the weight better and was a bit safer to use in this project. (affiliate link) After the playhouse was raised, blocks of wood were inserted under the four posts that hold up the base of the playhouse. This took quite a while, since each leg needed to be jacked up in succession, and blocks of wood inserted to raise the playhouse until it was high enough for the truck bed to fit under the playhouse. My husband was a bit of an expert at this part, since, the whole playhouse had been lifted off its base during Hurricane Fran, so he had experience of jacking it up in the past! Almost high enough. 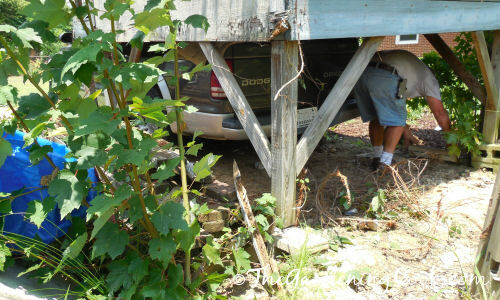 The truck bed has to be able to be backed under the playhouse for it to be moved. At this point we had lots of clearance at the front but the back still needed jacking up. 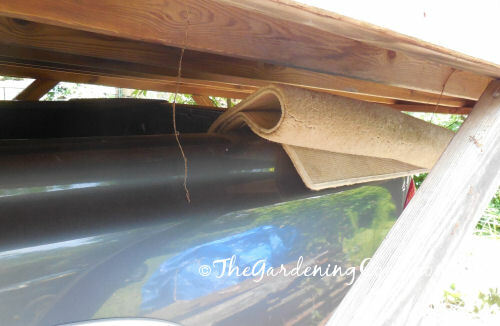 Pieces of carpet protect the finish of the truck bed. 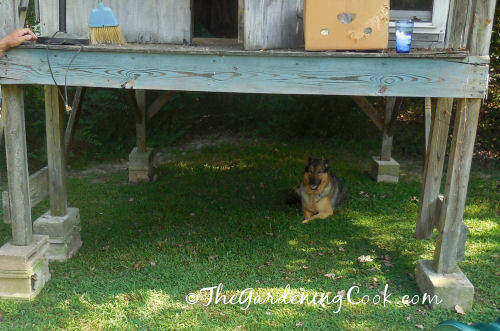 Planks of wood give the playhouse a firm base to sit on and spread the weight just a little. 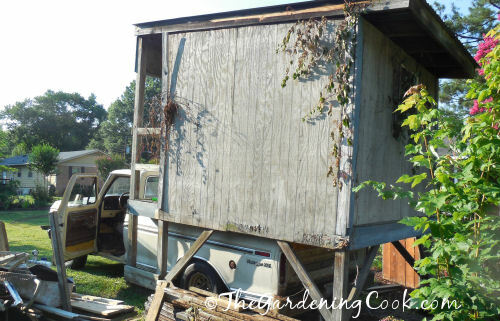 Now the back of the playhouse needed to be jacked up more so that the truck could be backed in as far as it would go. “Oh, oh” says my dog Ashleigh. “The truck is not long enough.” And this is where the problems began. 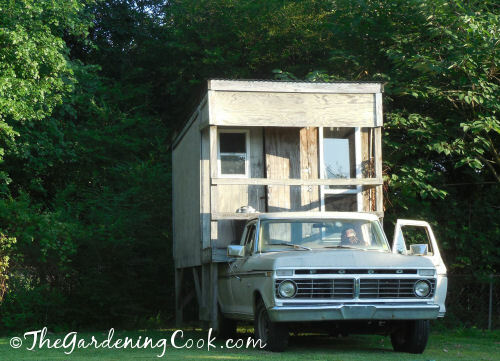 The original truck that had moved the playhouse to our yard had a bed that was about 8 feet long and the bed on our truck was about 6 feet. 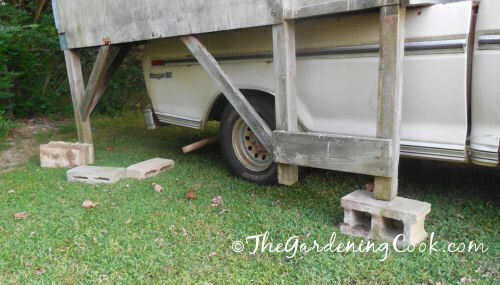 There was way too much over hang and when the back supports were removed and the playhouse lowered, it got bogged down and the truck would not move it. At least four hours had just been wasted. Back to the drawing board. The whole playhouse needed to be jacked up again so our truck could drive out. 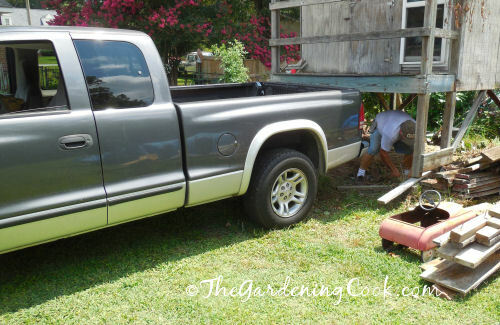 We started again with our neighbor’s truck which has an 8 foot bed. My poor hubby was admonished with “you don’t have a REAL truck anyway” by my neighbor as he generously loaned us his “real” truck. I have to admit it, but a “real truck” does the job a lot better! It was wider so it supported more of the playhouse and also longer so the back end of the house was not an issue. It was a tight squeeze getting it under the playhouse and took several tries and a lot of breath holding on my part but my husband finally managed to get the playhouse ready to be moved. 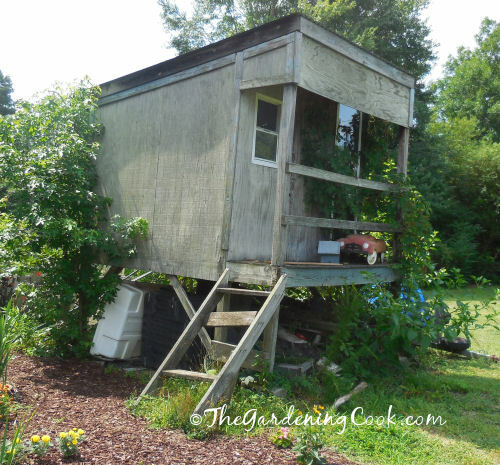 The next step was for my husband to just drive the playhouse from the old location and back it into the new location in the corner of our yard. It took a bit of maneuvering but Richard finally got it positioned where we wanted it. A new problem. Now the “real truck” would not start. Richard had managed to flood it, so we had to wait until it thoroughly cooled down so that the truck could be moved. 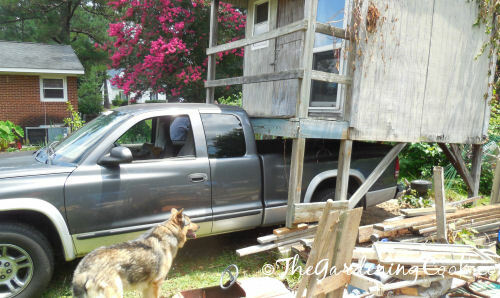 Once again, the process of jacking up the playhouse began, so that it would be raised off the truck bed so that he could drive the truck out. Success!! 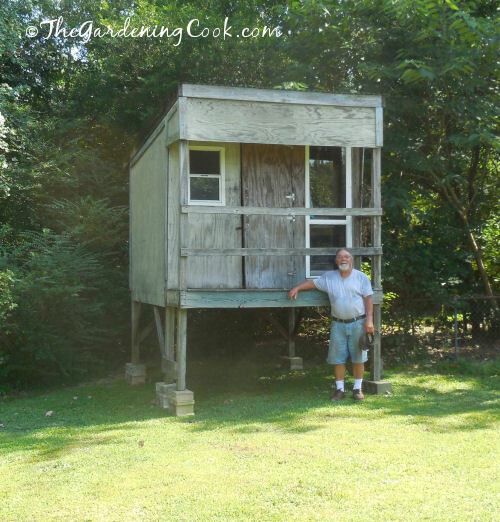 We had to wait until the next morning to move the truck before it would start, but Richard could finally drive it out and here is the playhouse in its new location. No longer an eyesore and it looks almost like a tree house now. Our supervisor loves the new shady spot. She told us we are not allowed to store dump things here anymore. 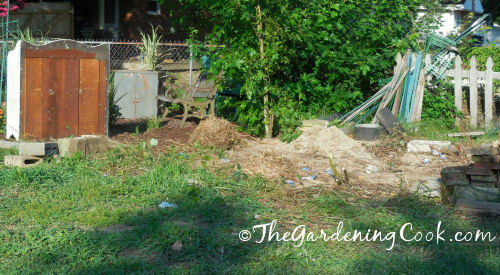 And this is the mess left over from the spot where from the original location of the playhouse. No prizes for guessing what I will be doing for a few weeks. 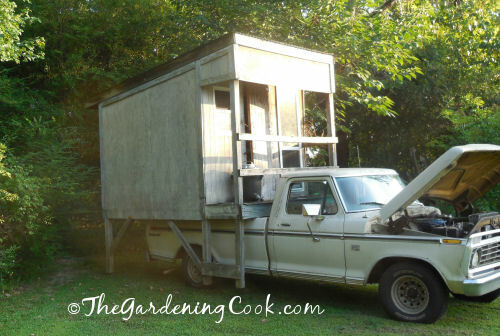 Use a truck with a long bed so you don’t waste half a day! 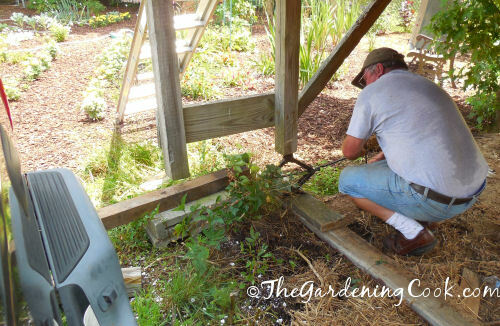 Add wood over the cushioning to give the base of the playhouse extra support. 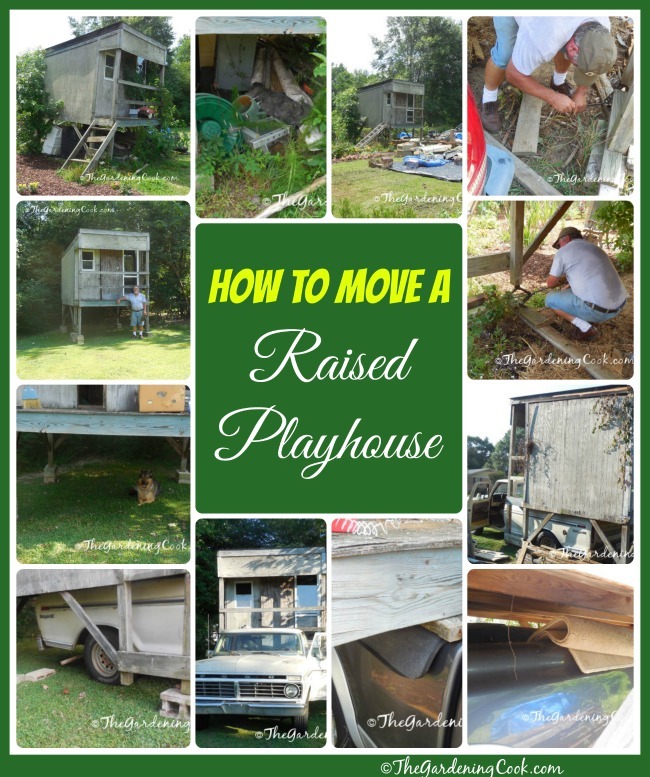 Lower the playhouse onto the truck bed. Enjoy the playhouse in its new position. Stay tuned for details on the playhouse make over. We plan to enclose the base with lattice (so that it will never again be an eyesore) and add an additional deck, some stairs that go up the front, some landscaping and a couple of chairs. And a fresh coat of paint! It will now be a perfect place to sit with an afternoon cocktail, and admire my back yard gardens. The location of the deck is perfect. The playhouse is in the shade for the biggest part of the day and again at cocktail hour. That will be great in our 90º days like it was today!